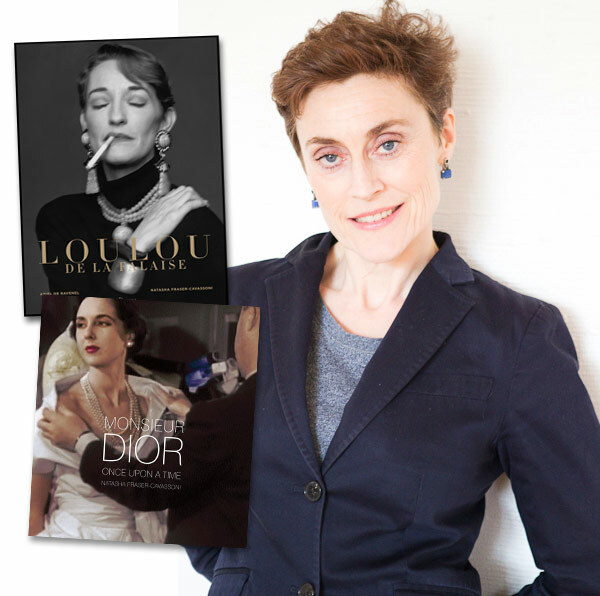 British journalist Natasha Fraser-Cavassoni is in NYC promoting her two new books: Monsieur Dior: Once Upon A Time, and Lou Lou de la Falaise, which she co-authored with Ariel de Ravenel. We were colleagues at Harper’s Bazaar ages ago, so it was nice to catch up with the uber busy writer. Thanks Natasha for answering a few questions! You must be very busy promoting two books, how do you keep yourself sane? Sane, Preston? What is that 4-letter word? I guess the demands of my two 13-year-old daughters (the twin word is banned in this household ) keeps me relatively grounded. Like everyone, a lot of imaginary whirling of plates goes on. But just when I think ‘phew,’ several imaginary plates crash to the ground. Oh and replacing loads of refined sugar with dried apricots, self-smoked almonds and coconut water. I was introduced to coconut water (is that the right term in the US) by Cate Blanchett on a shoot. Monoprix sells it, always handy, the water does seem to give energy. My siren de chic – Ariel de Ravenel – who found all the amazing images in our Loulou de la Falaise book. She always looks effortlessly elegant in flawlessly pressed Theory shirts or cashmere sweaters that she describes being “old lady colors” as well as vintage necklaces by Loulou de la Falaise. From top left: Pallas smoking tux, ink blue, Moynat Rejane saddle bag, Jim Hodges painting and t-shirt, Hilditch & Key night shirt, Roger Vivier buckle flats, Nancy Gonzalez clutch. Lucien Pellat-Finet jackets. LP-F is known for being the pope of cashmere but he tailors a mean jacket, perfect length and snug arm holes. Ines de la Fressange navy trench from Uniqlo – just when I was dreaming of one, Ines, a dear friend, delivered! An Alexander McQueen blue velvet dress achieving barmaid cleavage. One color that I can never resist: ink blue. A color that I discovered when working at the Chanel Studio as one of Karl Lagerfeld’s assistants. The Moynat Rejane saddle bag – it is flawless!! Thank you for this lovely interview, very refined ! I really want to read her book about Loulou de la Falaise, such an icon ! I love this woman’s taste and her favorites are my favorites! Preston, I appreciate that you feature so many women of style (and grace) who are middle age and older. Main stream fashion magazines consistently feature teenage and 20-something models wearing super luxury clothing and accessories. Rare is the younger woman who can afford luxury dressing, much less wants it. For me, luxury dressing requires some maturity and at least a sense that it was somehow earned. Ms. Fraser-Cavassoni is indeed chic, and a lot of it is her age.